Maybe you’ve heard this saying before: don’t grow up, it’s a trap. If you’re confined to the repetitive routine of work, sleep, repeat, then this statement rings especially true. Many of us feel trapped by the life we’ve set up for ourselves, like something’s missing. Even if you’ve got that dream job making big bucks, maybe you’ve found yourself continuously adding new possessions to try and fill this hole. What if there was a way to break free from society? To finally uproot your life and live the day-to-day on your terms? If this sounds appealing to you, RV living may be the escape you’re looking for. It sounds like a drastic change (and it is), but it can be more attainable than you think. Read on for our complete guide to living in an RV and how you can realistically achieve this way of life. Why Choose Living in an RV? How Much Does Full-Time RV Living Cost? Maybe you’ve already daydreamed about it. Life on the road can seem like the ultimate escape from the doldrums of everyday life. However, it’s not for anyone. Before you take any further steps, it’s important to consider the sacrifices you’ll have to make before living in an RV. Whether you’re in it for life or just an extended vacation, you’ll have to downsize your life quite a bit. You’ll also have to give up most of the basic luxuries you’ve grown accustomed to. You need to ask yourself which is more important to you: your possessions or the prospect of a simpler way of life. Living in an RV only affords you space for the essentials that you need to survive. You also will not have unlimited access to water, gas, and electricity, though there are solutions you’ll find on the road to cover your basic necessities. In order to navigate the small living space comfortably, you will need to get rid of most of your clothing, knick-knacks, personal mementos, electronics, beauty items, and more. Storage will be minimal and you won’t want any excessive possessions taking up space. If you think you can live without extraneous possessions, the next thing to think about is what you will do with them before you begin living in a camper. Many people prefer to find storage, such as a public storage unit or, if you’re lucky, space in the home of a friend or family member. If you’re totally committed, however, some may find it best to sell whatever possessions you can and use the money towards living on the road. If the thought of giving up the luxuries of stationary home living hasn’t scared you away, there are loads of benefits for living in an RV. Choosing this way of life can open a whole new way of life that you may never have thought possible. The freedom of living in an RV is perhaps the most attractive thing about the lifestyle. There are loads of RV parks and campsites to choose from, and there’s nothing stopping you from roaming as much as you please. Another benefit of living in an RV is the money you’ll save. It’s no secret that the cost of rent and homeownership is higher than it’s ever been these days. By downsizing to RV living, you’ll save some serious cash on rent and utility bills. Before you choose the right camper for full-time RV living, it’s important to consider your needs for space as well as amenities. If you have the time, comparison shopping at different dealerships can lead to the best possible outcomes. If you come across a camper you’re interested in, take time to get a feel for the interior. Try to picture yourself sleeping in the bed, taking a shower, and cooking in the kitchen. Does the setup feel right to you? Another important thing to consider when you’re shopping for an RV is the price. There are loads of different models to choose from at different price points. Ideally, you want to go for one that satisfies all your desires without going over budget. There’s also the option of adding a “toad” vehicle to the end of your RV, or going with an RV trailer that will be towed by your vehicle. Of course, you can also opt against having any sort of additional vehicle. Try to picture your ideal day of living in an RV and choose the vehicle that best suits your vision. What is the fuel efficiency of your vehicle and how often do you plan to stay on the move? This will help you get an idea of your fuel costs. What are the average costs of maintenance on your RV? Depending on your vehicle’s mileage and current state, this can vary greatly as well. Try to find some numbers online or ask your RV salesperson for some insight. Where will you be staying and for how long? Depending on amenities, the prices of campsites and RV parks can vary greatly. Many will also offer lower monthly rates as opposed to daily or weekly stays. What will your budget be for food and drink? A good way to calculate this is by tracking your current expenses and factoring it into your budget. Try to think of ways to cut costs, too. Planning a budget ahead of time can help you maximize your experience when living in an RV. Before you leave, it also helps to make a list of low-cost places you’d like to stay along with your chosen path of travel. While blindly and impulsively hitting the road can seem like an attractive option, the best thing to do is pre-plan so you can be sure you can afford your new life on the road. Giving up traditional home living doesn’t necessarily mean you’ll be giving up hot water or cooking on a stove. Many camper models feature water heaters, propane stoves for cooking, and hookups for unlimited water and electricity. Depending on where you park your RV, you can enjoy the freedom of RV living while still enjoying some of the basic comforts of home. If you’re staying somewhere off the grid or in a “bare bones” nature campsite without any RV hookups, you also have the option of adding a freshwater tank to your camper for a limited water supply that you’ll have to refill occasionally. Some gas stations and RV parks offer hoses where you can refill your tank for free, or you can stock up by buying individual gallons of water along the way. If you’re staying somewhere without hookups, you can still have electricity on the road as well. It’s a good idea to find a generator for sale to bring with you and have a power supply wherever you roam. Lastly, if you’re looking for wifi while you’re living in an RV, there are options for that as well. Some RV parks and campsites offer a (typically slow) wifi connection. Or you have the option of turning your phone into a mobile hotspot or purchasing a mobile data connection. With over 18,000 campgrounds in the U.S. alone, you’ve certainly got options for places to stay while living in an RV. It’s a good idea to plan your route ahead of time and find places to stay before you leave. If you’re not sure where to begin, just make a bucket list of places you’d like to see. There are tons of beautiful places to visit in the U.S. Find what speaks to you and plan your route around it. 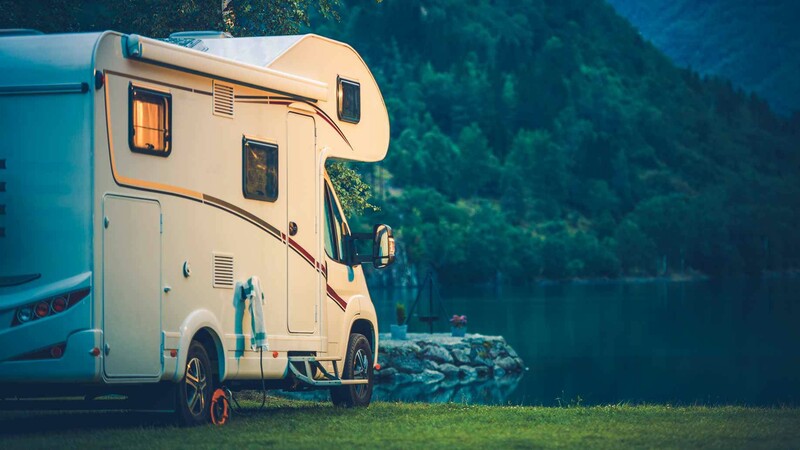 If you’re not living in an RV with a large chunk of savings or a retirement fund, it’s important to figure out how you’re going to make money when you’re on the road. Luckily, in today’s digital era, there are more options for remote positions than ever before. To start, figure out a product or service you can offer people. For example, blogging or SEO services are a great way to make money from wherever you are. You can find online classes or other resources to help you get started. If your professional talents lie elsewhere, find a way to make them a remote position. Research the best remote positions if you’re looking for ideas. Or, simply search and apply for remote positions online. Some RV parks and campsites will also offer free board and possible wages in exchange for labor. However, payment is usually minimal and the work can be unpleasant depending on who’s giving it. Your best bet is to start your own business and figure out a solid means of remote work. If you’re looking for freedom from the confines of everyday life, living in an RV can offer the lifestyle you’ve been searching for. With the right plan, a remote lifestyle is more attainable than you might think. For more lifestyle tips, check out our blog. What is the Secret of the Robust Health of the Chinese?